Please be advised that TOM’S newly launched Brake pad series for LEXUS LC500/500h (URZ100/GWZ100)　, LEXUS LS500/500h (VXFA5#/GVF5#) F SPORT through our distributor/ agent in your country from Feb. 2018. We would ask you to renew your same patronage for new products as for existing products. With high braking force and anti-fade capability, this pads have high balanced performance to minimize squeal and dust. 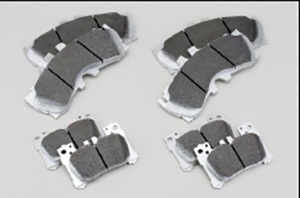 High performance brake pads for circuit drive developed by testing at Fuji speed way. With superior braking force and controllability, stable performance from normal temperature condition assured. ※There may be the case of squeal or dust depending on usage, condition etc.